Playing 1.e4 with White is often associated with having to know reams of opening theory but this does not have to be the case. Art games using great art, including dozens of jigsaws and card matching game. Not every chess player can achieve master strength, but all chess players can improve. With this certain knowledge, we have created a website to help you do just that. We have focussed on 3 simple areas which we believe will yeild dividends 1. Daily Prize Chess Problem, 2. Weekly Multi-Choice Quiz, 3. 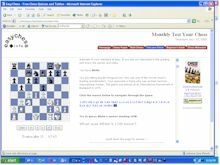 Monthly Classic Game Test - We also feature dvds and books etc from our partner site the the london Chess Center shop. you will find these around the site and on our chess goods page. "Instead we have focussed on 3 simple areas which we believe will yeild dividends"
In the 21st century, many chess players have become totally immersed in the study of openings, endlessly processing database information on their laptop computers. 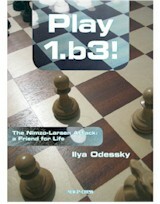 Even with limitless time, we would doubt that this is the best way for most chess players to develop their potential. But let’s face it, most of us do not have the time or resources which are available to the professional. Instead, we have focussed on three simple areas which, we believe, will yield dividends. In one part, we look at tactics. This website will provide a daily problem which will test and improve your flair for combinations. Another part will consist of multiple choice questions which will test your knowledge of various aspects of the game of chess. We will provide a new multiple choice problem each week. Last, and perhaps most importantly, we will invite you to follow a classic game from the past, and guess the moves of one of the masters. You will be allocated points according to how successful you are. When you have completed the test, you will be able to calculate your score and make an estimate of your growing strength. This ‘Test Your Chess’ section will appear monthly. Click on the links to take you to the relevant section. Everyman Chess 2010, Figurine Algebraic Notation, Paperback, 285pp. £16.99. The Nimzo-Indian: Move by Move (Everyman Chess) by John Emms, 368 pp. £19.99. The Fritztrainer Opening (also known as the Fritz Media System) series seeks to combine the benefits of a live lecture by a chess master and a database which may be used with a chess engine. "Are you tired of constantly following the same old opening moves? Fed up with always having to keep up with modern chess theory? Or perhaps you simply wish to try something new and exciting, but cannot decide between the numerous choices available? We have the answer!" " Dangerous Weapons is a brand-new series of opening books which supply the reader with an abundance of hard-hitting ideas to revitalize his or her opening repertoire. Many of the carefully chosen weapons are innovative, visually shocking, incredibly tricky, or have been unfairly discarded; they are guaranteed to throw even your most experienced opponent off balance." Did Capablanca’s personality sway judgments on his play? To read this file you need a pdf reader - . For example you can download the excellent Foxit reader free. My 60 Memorable Games was written over a period of several years and contains Fischer's objective, honest and self-critical annotations to games that he had won, drawn and even lost from 1957 to 1967 - but from which he had also learned valuable lessons. In fact, reading Fischer's intensely personal commentaries is like going back in time, watching live coverage of his over-the-board battles with the chess greats of his day. Soon he would become the greatest of them all.